John is still very much on life's journey and is still as creative as ever - he still writes, composes and performs! He is an icon in Zimbabwe and to this day has dominated their charts. His Zimsongs CD was No 1 for the whole of 2001! John is also the creator of "Tales of the Game Rangers" Series — a 4 album set of bush songs and stories that are still selling steadily since their release in 1989. Other well-known albums in campfire circles are "Circle of Life" (Long before Elton!) "Wild and Beautiful and Free" containing songs like "Jock of the Bushveld" (the original before the movies) and "Campfire 'n Jamboree" for Scouts and Guides. John's CD "Born in Africa" has been selling internationally following his tours to the USA, U.K, Australasia and Zimbabwe. On it are stunning new songs along with revivals of "The Lion Sleeps Tonight", "Skokiaan" and "Meadowlands". John has represented South Africa at the World Song Festival in Tokyo, he is a regular at the International Game Rangers Convention held at Berg 'n Dal in the Kruger National Park and at almost every Rhodesian and Zimbabwe reunion held around the world. John is at home in venues from Tokyo's Budokan Hall to Berg 'n Dal's outdoor boma, Bakobang Bush Lapa's to Mabula convention's. JOHN EDMOND was born on 18 November 1936 of Scottish parents in Luanshya, Northern Rhodesia (now Zambia); on the Roan Antelope copper mine. His father, described by John as “a colourful character” was a miner, prospector, war hero and mechanical engineer and died in Scotland in 1992 at the age of 96. His mother passed away during a heart operation while John was in his teens. John’s childhood was a varied one with his parents moving between Scotland and Central Africa. He attended school in Luanshya, Northern Rhodesia, Edinburgh, Scotland, and in South Africa at Christian Brothers College in Pretoria. He displayed a strong affinity to music at an early age. Given a mouth organ as a birthday gift from his grandmother, three-year-old John mastered the instrument within half an hour! As a boy scout in Luanshya, he took to the bugle and played in the local scout bugle band. While at school in Edinburgh he was chosen to sing in the famous St John’s boy’s choir and regularly featured in lead roles at Christian Brothers College in Gilbert and Sullivan operettas. The college’s pipe band was John’s first love however and, as leading drummer, he went on to win the South African Junior drumming championships at the Royal Scottish gathering at Wembley in 1953. After school, John found employment at the Roan Antelope copper mine in their punched card division. After some time he opted to join the (Southern) Rhodesian Army in Bulawayo which saw him serve in the Congo (now Zaire), Nyasaland (now Malawi and Southern Rhodesia (now Zimbabwe). During this time John bought his first guitar at a trading store for one pound. In the army, he met Bill Coleman and as two musically ignorant troopers, they learnt to play the guitar by trading chord shapes and ideas. John soon roped his army pals, Eugene van der Watt and Ian Kerr in, to form the Bushcats Skiffle Group. The group was a huge success among its peers and progressed into cabaret and rock ‘n roll. After his military stint, an aptitude test at the copper mine resulted in John’s selection to study computers at Moore Hall in England. During this time he hitch-hiked around Europe and met up with Rob de Nijs in Amsterdam (who later became the “Cliff Richard” of Holland) John and Rob played as a duo in the pubs of Amsterdam’s dock area. 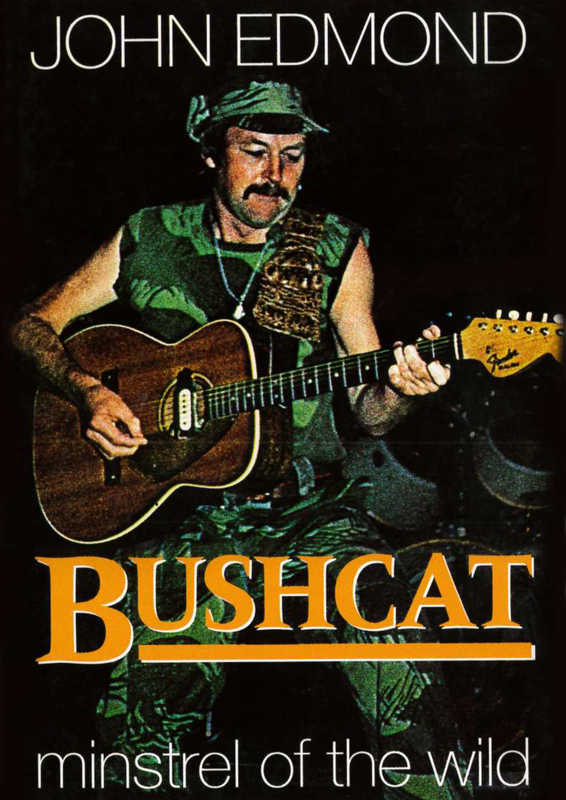 On his return to Rhodesia, the Bushcats re-grouped, performing around the country until the band’s demise in 1967 when John applied for the position of computer programmer/analyst with the Greatermans group in South Africa. In his spare time, John concentrated on folk music and played at the Nite Beat, the Troubadour and many other Johannesburg folk music venues. Seeing the potential for a folk trio he urged ex-Bushcat Allan Goodwin and Stevie van Kerken (Lange) to leave Rhodesia and join him in forming the New Trends Folk Trio. A two LP recording contract with Louis Combrink and Anton de Waal on the EMI label brought them much acclaim and after their hit, “Gypsy Man” they were dubbed South Africa’s “Seekers”. They once played at a Royal Command Performance in Swaziland for the Duke and Duchess of Kent. After two years in cabaret, the group disbanded and each member went solo – Stevie later singing as a backing vocalist for Elton John. In the meantime, songwriting had become John’s major priority. After being rejected as a singer by several record companies, he was bluntly informed: “stick to writing, you’re no singer”. Write he did, with great success for artists such as Nick Taylor, Pat Gregory, John Berks, Four Jacks and a Jill, Dave Mills, Barbara Ray and many others. Four Jack and a Jill’s “Sad Little Pigeon” entered Billboard’s chart in the USA, Pat Gregory’s “Mr Dreamer” charted in South Africa and John Berks dented the LM hit parade with “Ek is ‘n Ge”. In 1970 John won the award for Best Folk Song in the South Africa Song Festival (Previously known as the Durban Song Festival) with “A New Generation”, which was sung by Ted Lynn. In 1969, while making a demo for Nick Taylor, John was heard by the producer, Terry Dempsey. Impressed, Terry offered him a recording contract on the spot. John’s success was immediate, with his first single “Fairy Tales” entering Springbok’s Top 20 hit parade on 9 January 1970 where it peaked at no. 13, enjoying a five-week stay on the charts. His second single. “Round and Around” repeated this success in July and August of the same year when it reached no. 13 on the Top 20 and sojourned on the hit parade for eight weeks. Written and produced by Terry Dempsey, the song was South Africa’s entry at the 1970 World Song Festival in Japan. John performed “Round and Around” in Tokyo, which was broadcast to millions of viewers around the world. On a stopover in Australia, he discovered two songs that would be his next hits: “Boom Sha La La Lo” (written for The Seekers by Hans Poulsen and Bruce Woodley) and “Pasadena” (penned by George Young of the Easy Beats, Harry Vanda and actor, David Hemmings). Released in May 1971, “Boom Sha La La Lo” peaked at no. 10 on Springbok’s Top 20 hit parade in July and spent ten weeks on the charts. “Pasadena” peaked at no 17 on the Top 20 in May 1972 and spent five weeks on the charts. By now John had left the computer industry and secured a position at Gallo Music Publishing. He worked his way up the rungs of the trade under the guidance of his newly found mentor, the late Ralph Trewhella. John and Terry Dempsey penned English lyrics to an Italian melody John had heard while abroad. The result was “Every Day, Every Night” which spent 17 weeks on the charts and peaked at no 7 on Springbok’s Top 20. In September 1972. John discovered the song “Toy Train” on an American sample record and decided to record it. Produced by Terry Dempsey, the single would be his biggest success locally, spending 18 weeks on the charts and reaching no. 6 on Springbok’s Top 20 in June 1973. Terry liked John singing continental songs and penned lyrics for a German song called “Hallo Susann”, which also charted locally, John’s next record was one written by himself, Patric van Blerk and Fransua Roos called “Goodbye is the Saddest Song”. With brilliant guitar work by Trevor Rabin, John secured his seventh consecutive South Africa hit a feat only equalled by Dave Mills. The song reached no. 10 on Springbok’s Top 20 and spent seven weeks on the hit parade. He was then much in demand and toured South Africa with Vicky Leandros, Middle of the Road and Boomer. The dog hero from the T.V. series. Back in South Africa John rose to the position of general manager at Gallo Music Publishing and represented Gallo seventeen times at the Cannes Music Convention (MIDEM). Sports have always played an important part in John’s life and an early ruby career earned him “Player of the Year” with the Roan Antelopes team. In several matches, he marked Springbok Tom van Vollenhoven and the two became firm friends. While in Japan, John was very taken with the art of karate and after encouragement from Allan Goodwin (New Trends guitarist and a black belt himself); John took up the sport earnestly. He eventually graded to third Dan and ran his own karate school in Johannesburg. He coached many champions and his eldest daughter, Shelley, became a Springbok trialist and Transvaal Karate champion. John has four children. His eldest, Grant, has followed in his father’s footsteps and is a successful musician who doubles with his wife Gillian – the duo calling themselves Stepping Out. Natalie, John’s second daughter, is an accomplished artist and was responsible for the artwork on several of John’s album sleeves. The youngest child, John Ross, is also a talented musician and has mastered the flute, bagpipes and keyboards and cut his first song “Baby Love Blue Eyes” (Which he wrote for his wife Nadia when doing a stint in Afghanistan as a C130 pilot) the song features on Johns “That’s what I call a Love song” album. After leaving the Gallo Group to do professional karate and run his own publishing company, Roan Antelope Music, John had more time to move into another sphere of interest. Alongside the karate school, his wife Teresa ran a successful modelling and a dancing academy; An accomplished model and dancer herself. She doubled as secretary and professional manager to the music company and as a team, she and John went from strength to strength with their entrepreneurship. She assisted John with translations and phonetic coaching to record two Afrikaans children’s albums with Joanna Field, John and Joanna also recorded two English nursery rhyme albums, which were released in Britain, the United States and Australia. His single, “Portugal I Love You”, was released in Brazil. John and Teresa bought a farm in the Limpopo Province bushveld. After building and developing the property, they established a private game farm and lodge called “Kunkuru” (Tswana for Roan Antelope). After constructing an airstrip on their game farm, John trained as a pilot and got his “wings” in 1990. In 1994 whilst piloting his aircraft over Lake Kariba, the plane’s engine exploded and caught fire. John managed a miraculous forced landing at Binga and his family escaped with no injuries. This incident spurred John to pen “Angels on my Wingtips” The Edmonds successfully run their publishing firm and at one time there dancing and karate schools from the lodge. Inspired by the bushveld, John wrote stories and songs for a successful album series entitled, “Tales of the Game Rangers”. Other projects include an album for Scouts, Cubs, Girl-Guides and Brownies entitled “Camp Fire ‘n Jamboree”. John wrote his autobiography, “Bushcat – Minstrel of the Wild” documenting his life from 1936 to 1974 and has been “nagged” by readers to write “Bushcat Π. His cd’s cover many genres on subjects like aviation, wildlife, pop, Rhodesiana, love songs, country, rock and even military history i.e. “The Boer War in Song” which has been well received in S.A, UK, Australia, Canada and New Zealand. As a songwriter, performer and producer John’s talents have taken him all over the world. He was elected to the board of SAMRO (Southern African Music Rights Organisation) and NORM (National Organisation for Rights in Music) and carries the welfare of fellow musicians and composers at heart. Credited with a prolific output of over 500 compositions (more than a hundred of which have been recorded by other artists), 38 albums, 28 singles, 30 record productions and three songbooks to his name, John Edmond has contributed much to the music world.